It's almost as if there is a three-year delay programme on the Brexit process. What should have been one of the very first things that Mrs May contemplated was a government of national unity – or, at the very least, a cross-party cabinet committee. Sadly, it's almost certainly a case of too little, too late for the prime minister to experience a Damascene conversion, even if that's what we saw yesterday evening when she addressed the nation from Downing Street in what was a remarkably short speech. She had, she said, just come from chairing seven hours of Cabinet meetings where, if we are to believe what we are told, acrimonious ministers were split between wanting a no-deal Brexit and opting for a customs union, with the no-dealers holding the majority. The very fact that these are not polar equivalents tells you something of the disarray in government, but it led to Mrs May admitting in her speech that there were some who were "so fed up with delay and endless arguments that they would like to leave with [a] no-deal next week". As fast as she raised the prospect, though, she rejected it, instead opting for a further extension of Article 50, "one that is as short as possible and which ends when we pass a deal". In so doing, said the BBC, she was choosing a deal over party unity. Recognising that the European Council had imposed conditions and that the Commons had not come up with an answer, she was "taking action to break the logjam", by offering to sit down with the Leader of the Opposition to try to agree a plan. Both would have to stick to this plan, which would include the current Withdrawal Agreement, on top of which the leaders would "agree an approach on a Future Relationship that delivers on the result of the Referendum", which Mrs May could put to the MP collective for approval before taking it to next week's European Council. If we cannot agree on a single unified approach, Mrs May said, "we would instead agree a number of options for the Future Relationship that we could put to the House in a series of votes to determine which course to pursue", the outcome of which the government would take as binding, along with the opposition. With that, Mrs May would plan to bring forward the Withdrawal Agreement Bill to ensure it was passed before 22nd May so that the UK would not have to take part in European Elections – effectively dropping us out of the EU by that date. Interestingly, Jeremy Corbyn took little time to respond, saying that he would be very happy to meet the prime minister. This may even happen today. Acknowledging that Mrs May had "made a move", he recognised his responsibility "to represent the people who supported Labour in the last election and the people who didn't support Labour but nevertheless want certainty and security for their own future". And that's the basis on which he will meet her and have discussions. "Labour has put forward our proposals to ensure there is a customs union with the EU, access to vital markets and protections of our standards of consumer, environmental and workers' rights", he said. "And we'll ensure that those are on the table. We're also very clear that there has to be an absolute guarantee that the Good Friday Agreement is maintained for peace in Northern Ireland". Despite that, Corbyn complained that the prime minister had not shown much sign of compromise but, he said, "I'm pleased that today she's indicated she'll accept the view of parliament and is prepared to reach out and have that discussion". If this plan has any chance of working, it has to be done swiftly. Although the European Council is on the 10th – next Wednesday – when any decision will be made as to whether to extend the Article 50 period, the General Affairs Council is the day before. Since it is there that the preparatory work is done, at the UK end, whatever is to happen must be done and dusted by the end of business on Monday, in order to get the result to the General Affairs Council. Presumably, when it comes to the offer to the Westminster parliament, Mrs May will want to stick to the existing text of the political declaration, expecting Mr Corbyn to gamble on parliament voting to include a specific reference to a customs union. Whatever is agreed will then have to be bundled into a final motion which allows the Withdrawal Agreement to be ratified, this time with the support of Labour – by Monday at the latest. There are considerable odds of it not getting as far as the vote though. Although Mr Corbyn has agreed to talks, he could walk out at any time – having stage-managed his departure to ensure that Mrs May takes her share of the blame. The temptation for him to do this will be strong, as he will be looking to an opportunity to pursue a general election. Coming to the prime minister's rescue has never been on his agenda. Corbyn must also be cheered by the Guardian editorial, which his aides will doubtless be studying. It sees a prime minister "shrunken by defeat", embarking on this stratagem only because she has run out of road. If the initiative gets as far as a vote, both leaders are at risk. They must rely on their MPs obeying their respective party whips. The danger, of course, is that a majority will refuse to be railroaded and will still vote down the Withdrawal Agreement, irrespective of what is tacked on to the Political Declaration. Others, who might have been supportive of the Withdrawal Agreement, might vote down the attempt to bring in a customs union, if that survives the cut. Nevertheless, as a last throw of the dice from Mrs May, it is at least inventive, and it is too early to dismiss it as doomed to failure. We may have to wait until tomorrow to do that, although it may be the Monday before we are absolutely certain that it has crashed and burned. If it succeeds, we are back where we were before 29 March with the possibility of leaving on 22 May, if the European Council agrees to an extension. Yet, with the smart money predicting failure of Mrs May's latest initiative, this could see us dumped unceremoniously out of the EU without a deal on 12 April. There is, however, an alternative scenario where the May/Corbyn duo are still talking by 9 April, with no decision reached the following day either. That would leave Mrs May with empty hands but offering a promise of something more substantial than she has had to date. This would leave the European Council in an awkward position. It doesn't take a rocket scientist to work out that it would wish to avoid an early no-deal, but it has boxed itself in by insisting that the UK comes armed with proposals for a way forward. It could give its assent to a 22 May cut-off but, unless Mrs May also committed to holding European elections, that would be the end. In any event, Michel Barnier warns that any further extension would carry significant risks for the EU. A strong justification would be needed, and that does not look to be forthcoming. Given that the prime minister is in any case ruling out participation in the elections – which would preclude a further extension on those grounds alone - she seems to be excluding the possibility of further extensions, beyond 22 May. The whole of her initiative, therefore, is to buy time on the one hand, and to secure an orderly exit – holding the future to ransom if she is forced to concede a customs union. But she really does seem to want that extra time. What Mrs May has already succeeded in doing, though, is in dominating the media headlines. 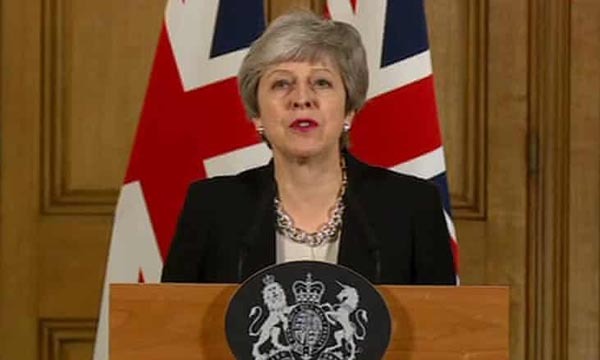 With her speech timed for just after 6pm – and kept short - the main broadcast bulletins carried it live, and were able to stay with the whole speech. Print media have followed, sweeping most of today's Brexit coverage from the front pages. Thus we see the Letwin/Cooper plan disappear from the media. This was aimed at bringing in a Bill to force the prime minister to seek an Article 50 extension rather than opt for a no-deal, with a paving Bill due today to commandeer parliament for rest of week in order to get it through. Now, I suspect MPs will not want to take any action that could block the May initiative, which may mean that we've seen the last of this for the moment. Even if it was allowed to run, it would most probably have impinged on Crown prerogative powers, in which case Mrs May could have asked the Queen to refuse Royal Assent. And even then, an extension does not lie within the gift of the UK government, when it requires unanimous approval from the EU-27. One wonders if Yvette Cooper, the primary sponsor of the Bill, has even a glimmer of understanding of what she's up against. Nevertheless, it gives us a good idea of what we're up against – a parliament which is as much at sea as the government, with nobody having any real idea of what to do next. After three years, it is as if there had never been a debate, for all the progress that has been made.